It’s probably just as well we had a breather between this and the twin pronged attack of The Prestige and The Illusionist, as Gillian Armstrong’s latest feature certainly covers similar territory. Grisoni and Ward’s script explores the great Harry Houdini’s fascination with the psychic world (and his attempts to debunk its practitioners) through the means of a love story. Houdini (Guy Pearce) has challenged any medium to make contact with his deceased mother, offering a reward of $10,000. Con artist Mary McGarvie (Catherine Zeta-Jones) and her daughter Benji (Saoirse Ronan) step up to the plate, only to find that this gig will be a little more difficult than their usual staged performances. Gillian Armstrong’s film – for the most part – manages to strike the right balance between the mundane and the magical, and if you forgive the rather crappy special effects, it is a beautiful picture. 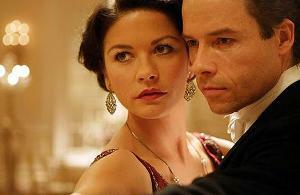 Zeta Jones is actually rather good as Mary, and her initial scenes with Houdini are great. The problems all really hinge on the rather intangible romance that forms awkwardly throughout the entire film. We never get a handle on Mary or Houdini’s intentions – and though one might argue that they themselves have no idea how to explain their feelings for each other, it makes for a frustrating film. We have ambition, greed and obsession tied in with love, and are never sure which of these elements are truly driving our characters. Saoirse Ronan manages to steal the film away from the adult performers once again. Anyone wondering if her performance in Atonement was a fluke need look no further than this. Even when she’s on the periphery, she’s an actress that draws all attention towards her. Benji is very different to Briony from Atonement, yet is still driven by some grim determination. Pearce does an okay job as Houdini but there’s something missing – he doesn’t quite have the presence one would expect, even in the scenes when he’s ‘at work’, performing to hundreds. Death Defying Acts was by no means a bad film, but it didn’t captivate the way in which it should have. There were some particularly strong moments, but the further we got into the romance, the more distanced I felt. It turns out that all three stage magician themed films of recent years have been disappointing, though at least this one doesn’t have quite the ego of The Prestige.